Payroll Services Fort Worth: How Does It Work? How Do Payroll Services Work? As a business, you want to make sure that you can pay your employees on time and in the correct amounts. Whether you’re a startup or a small business, finding the right payroll services to ensure your employees are being paid adequately is important to keep satisfied workers. Your employees are depending on that money for their livelihood, so having a paycheck in the correct amount and on the right day is vital. If you have errors on the paychecks, then your employees could become concerned in knowing they are getting paid the right amount, which could cause a bit of chaos for billing. If you want to hire a payroll service that has your interests in mind, then contact Journey Business Solutions for our easy and secure services. When finding the right payroll services for your company, you may encounter a variety of options on the Internet. Due to the accessibility the Internet provides, you can take advantage of online payroll services. Online payroll services are all online and operate on a cloud instead of with software; however, the downfall of online payroll services is that if you mess up, then it’s on you as a business. Hiring outsource payroll services allow your business to not worry about paying employees on time, taking the taxes out, reporting to the government, and the myriad of other facets that are in conjunction with payroll. While you may want to take advantage of online services or download software, when you hire Journey Business Solutions, you can take one thing off your plate as a boss. Now that you know why it’s beneficial to outsource payroll services, let’s dive into how exactly these services work. First, we make payroll services easy. We understand what it’s like being a small, startup business, which is why we want to take some of your duties off of your plate. 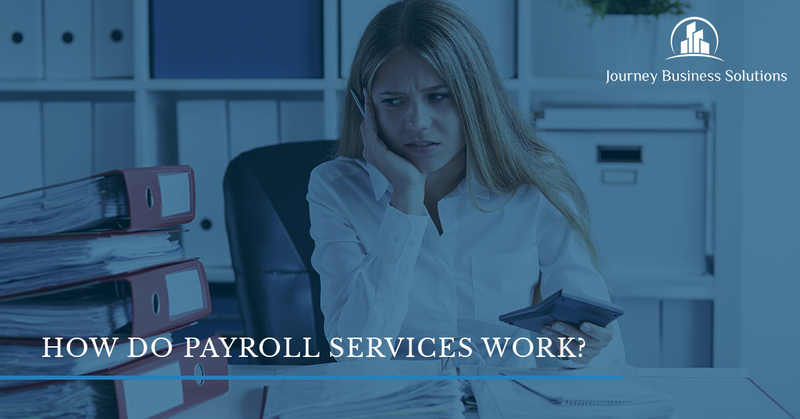 When it comes to the steps of payroll services, there are a few places where things can go wrong if you don’t have the necessary training or knowledge about balancing the books. Our professional and knowledgeable team of experts will be able to identify any miscalculations before they come to pass. The first step in how payroll services work is building a compensation package, paying the employees, and schedule the times of the month that your workers get paid. When you start a business, you’re going to want to set up the regular wages, special bonuses, commission, health insurance, and any other pre-tax benefits such as 401Ks. What’s neat about pre-taxed benefits is the increase in the employee retention, the money it saves you, and the incentives it creates for the company. In addition, you’ll want to make your company a special place to work by utilizing unique tools that set your business apart from other establishments. In addition, when your employees get hired, they might want to take advantage of direct deposit. Taxes aren’t just a nuisance for individuals and families, they’re also something businesses need to do as well. If you notice in your paycheck, you have the taxes taken out for Medicare, Social Security, state, federal, and even city depending on where you live. Paying taxes and withholding them is very important because if the taxes aren’t done correctly, the company and the individual could end up owing a lot of money. Taxes need to be done by the employee and the employer to ensure the right amounts of money are going to the right places. As a business, you need to report the number of tax withholdings, employee status, and payments, to each of the governments from local to federal. You need to do this on a quarterly or a yearly basis depending on the type of business you are as well as the size of your company. This part is one of the most complicated and headache-inducing portions. It can also be easily misunderstood, so it’s beneficial to have a payroll service that can eliminate any mistakes before they even occur. Lastly, as a payroll service, it’s vital that your business follows the labor compliances. This means that your company needs to follow the minimum wage regulations, overtime rules, the employee termination procedures for your state, and hang the labor law posters where people can read them. How To Choose Payroll Services? For more information on our payroll services, reach out to us! We look forward to helping you build your business!